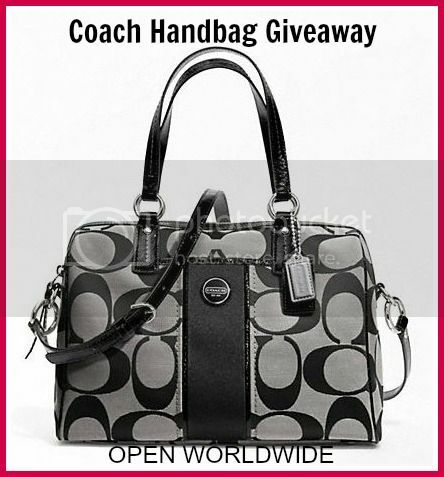 Upcoming Coach Handbag Worldwide group giveaway... This Signature Stripe Satchel is made with signature fabric with patent fabric trim, inside zip and multifunction pockets, zip-top closure, fabric lining, outside open pocket, handles with 7" drop, Longer strap for shoulder or cross body wear. The measurement is 12" (L) x 8 1/4" (H) x 5 1/2" (W). Sign up here to be part of this group giveaway between November 16 to December 16. Please mention Createwithmom referred you.